On 28 March, a meeting was held in Zintan between representatives from the western Libyan towns of Zintan and Misrata. The meeting concluded with the scheduling of a follow up meeting in Misrata and the production of a six point communiqué of shared objectives. 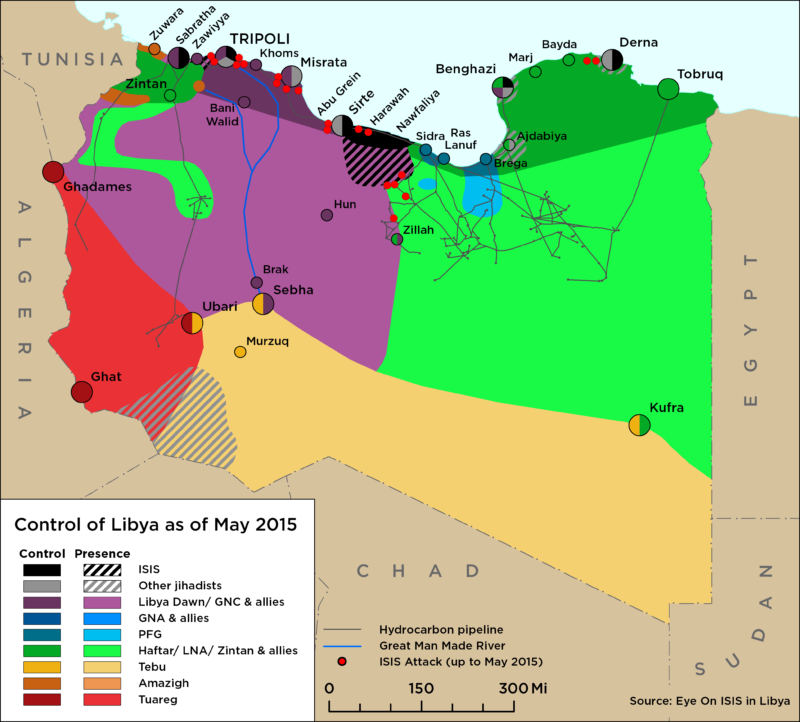 On 29 March, the Libyan National Army (LNA) undertook airstrikes on a Chadian militant group checkpoint in southern Libya. A Zintani militia claims to have released Saif al-Islam al-Qadhafi while the HoR releases a blacklist of Libyan individuals and entities it claims are linked to terrorist activities through Qatar. On 13 December, ISIS distributed leaflets threatening to attack security institutions and personnel in Rajban and Zintan. On 6 October, the GNA and its new UN-backed Security Arrangements Committee announced new security arrangements in Tripoli. On 7 October, the GNA announced a reshuffle of its cabinet and assigned several new ministers. Following the conclusion of clashes in Tripoli on 25 September, the GNA is moving to redraw security arrangements in the capital through the UN facilitated Security Arrangements Committee of Greater Tripoli. In light of this the GNA Local Government Minister is hosting a meeting of municipal mayors on 2 October to discuss decentralisation and the devolution of security functions to municipalities. 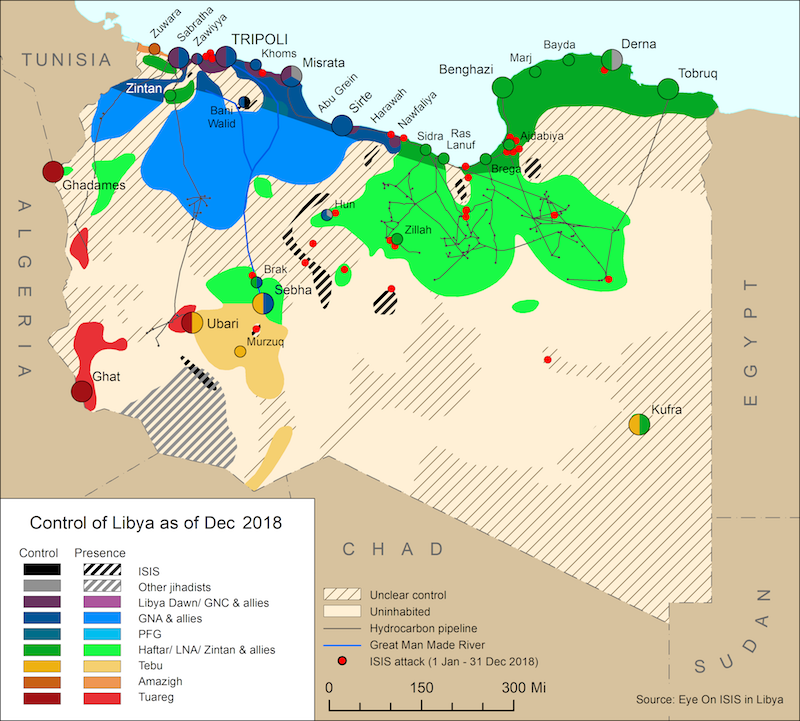 Major conflict erupted between militias in Tripoli on 27 August that has expanded over the following days into what seems to be a semi-coordinated military campaign aimed at eradicating the power of Tripoli-based militias, by an alliance of forces primarily including Tarhuna, Misrata and Zintan. On 6 July, the GNA issued a decree instating the commander of the Zintan Special Operations Force, Emad Trabelsi, as the President of the General Security Directorate. On 7 July, clashes took between Abdelghani al-Kikli aka Ghneiwa forces from Abu Slim and a former militia leader under his command. On 26 April, Libyan National Army (LNA) commander Khalifa Haftar landed at Benghazi. On 27 April, the Awlad Suliman Tribal Council in Sebha issued a statement welcoming Haftar’s return and declaring loyalty and readiness to support him. On 25 April, a delegation from the city of Zintan paid a return visit to Misrata, where delegates from both cities signed a reconciliation agreement. On 4 March, four people were allegedly injured by artillery shelling from the LNA 321 artillery battalion on al-Zintan neighbourhood near the western entrance of Derna. The following day the UN Secretary-General envoy, Ghassan Salame held a meeting in Tripoli with a delegation from Derna to discuss the evolving humanitarian situation in the city.